For 177 high school students who never thought they’d have the dream of college, Higher Edge has been a smooth path to realize that dream. Executive Director Chris Soto founded the New London-based organization seven years ago after studying a similar model in Providence, Rhode Island. “When school budgets are cut, the guidance counselor is going to be the first person to go before a math teacher is cut,” says Soto. “Students from under-resourced schools deserve to go to college, the same as students whose parents might pay anywhere from ten to twenty thousand dollars for that guidance support.” The mission of Higher Edge is to provide that same high level of support to qualified students in the region. Does it work? The proof is in the graduates. McCray entered Bentley on full scholarships and set out to design a career path. His goal is to join a marketing firm, then at some point be in a place to start his own community center where he can teach inner city students about financial literacy and mental health. Queenie Diaz, another New London High School graduate, now attends nursing school at University of Connecticut at Avery Point. After returning to the United States to live, Diaz and her siblings were placed in separate foster homes, not the happiest childhood she could imagine. For Diaz, the experience was a real success; she had so many scholarships that her tuition at Avery Point and all her books were covered. Higher Edge is the first such organization in eastern Connecticut, with the main office in New London serving Science and Tech at NLHS, Grasso Tech in Groton, and sometimes Fitch; a satellite office in Willimantic serves Windham High School and Windham Tech. 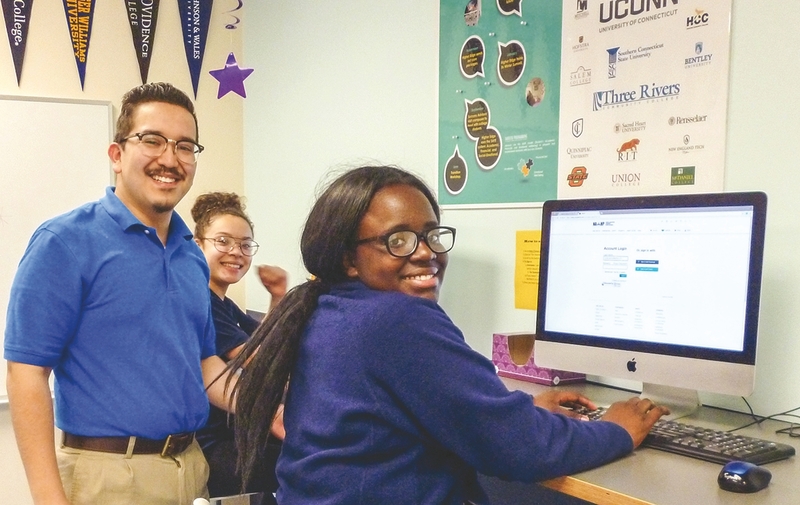 The organization consists of two programs: the College Access Program (CAP) for high school students who want to go to college, and the Success Program to support graduates who’ve entered college. CAP program manager Mauro Diaz-Hernandez says he loves working with students. “They all have unique stories. You pass by these students every day on the street, or at the store, and would never know some of the things they’ve been through,” he says. The College Access Program coordinates paperwork, counseling, and organization of trips for students to visit colleges. They also help students make educated financial choices. Other activities include essay-writing workshops, interview prep classes with subjects like wearing proper attire, or doing handshakes correctly. Higher Edge visits schools and talks about how the dream of college can be real. All their information is online and they welcome any student who wants to work toward a college in their future. If there’s one message that Higher Edge wants to send, it’s to debunk the myth that students from under-resourced schools can’t succeed in college. They can, according to Soto, if they have the same resources and support as their peers from surrounding schools. When they are supported, they thrive. Higher Edge’s ultimate goal is to get as many students into college as possible and, so far, the success stories are good promotion. Higher Edge Director Chris Soto and Success Program Director Luisanna Cabrera.